A Royal Marine from Larne who has admitted bomb-making charges is due to be sentenced at the Old Bailey in London today (Monday). Thirty-one-year-old Ciaran Maxwell will learn whether or not he will be handed a life sentence. On Friday, the court was told by the judge that he must now decide if Maxwell is dangerous and if this is a case for life imprisonment. Maxwell’s defence barrister insisted that his client had “no long-lasting republican ideology and was not ideologically driven”. Instead, he maintained that Maxwell had “faked” his support for dissident republicans. The barrister claimed that Maxwell indicated that he had been “forced to pretend he had republican sympathies that he did not have”. He stated that “fear of being in way above his head was effectively what paralysed him”. The barrister said that his client had “felt frozen and scared to make a move which would potentially reveal the life he had been leading”. During the pre-sentencing hearing, the court had been told that the accused had suffered post-traumatic stress disorder after a sectarian beating in his home town when he was 16-years-old but the prosecution has dismissed the possibility that this beating had “motivated his offending”. The pre-sentence hearing was told that Maxwell was “left for dead” in a field after being assaulted with golf clubs, iron bars and hammers. Ciaran Maxwell pictured after he was beaten by loyalists in 2002. His defence barrister also stated that as a Catholic growing up in Larne, Maxwell “feared violence on a daily basis”. The court was also told that a doctor’s report said Maxwell had suffered from post-traumatic stress disorder (PTSD) in the immediate aftermath of the attack, and that condition had persisted into his 20s. When Maxwell joined the Royal Marines, his barrister said his client “feared that being identified as a member of the British military would put his family in Larne under threat from republicans and that they may even be killed”. His barrister went on to say that his client “was in over his head and the PTSD presented some difficulty in dealing rationally with the situation”, adding that the case was “one of contradictions”. “He was Marine by day and it would seem republican bomb-maker on leave”, he added. He suggested that Maxwell was “trapped in an intolerable double life”. The court also heard that Maxwell had once given a presentation to other Royal Marines on the security situation in Northern Ireland. He was due to be promoted to the rank of corporal before his arrest, and was described in court as someone who would have been thought of as a “successful member of the military”. The barrister commented that his client was “an obsessive in his planning, someone who was a record keeper, organised and liked to be tidy and made copious notes”. 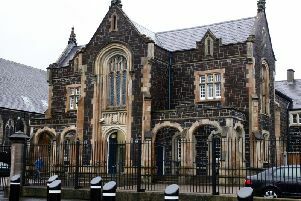 The defence said Maxwell started making explosives as “a rather unusual hobby” with a man in Larne who was later jailed for explosives offences. The court was told that Niall Lehd had known Maxwell since their days as pupils at the same school and the Marine had gone for a drink with him while on leave. The hearing heard how Lehd told Maxwell he was a “member of the dissident republican paramilitary group, the Continuity IRA”. During their drinking session, the barrister said that his client had “ended up saying a little bit too much” and was identified as “being of use” to dissident republicans. “Lehd was the instigator, enthusiasm and driving force, a very sinister figure indeed,” the defence barrister told the court. “Maxwell has made some very bad decisions that will haunt him and members of his family for a significant amount of time to come,” he stated. Thirty-one-year-old Ciaran Maxwell had been living in Exminster, in Devon at the time of his arrest. On Thursday (yesterday), the court also heard that 43 weapons hides were located in Northern Ireland and England, including 24 near Larne. Another 19 were found at Powderham New Plantation, close to his home in England. Four pipe bombs have been used in Northern Ireland, including one in Carnlough, and two detonated after his arrest in August 2016 had “clear potential to cause death and injury”. Prosecutor Richard Whittam QC said that there is “evidence of purchases he made by email being sent straight to Northern Ireland”. He stated that “delivery of some of those chemicals and equipment went to that address of his late grandmother’s”. Instead, he was “motivated by dissident republican sympathies and a hostility broadly to the United Kingdom”, the prosecutor continued. A list of targets included addresses of police officers, military staff an MI5 member and loyalists. In February, Maxwell admitted a number of offences, including bomb-making and storing stolen military weapons. He also pleaded guilty to drugs and fraud charges. DNA evidence found at one of the hides outside Larne led to Maxwell’s arrest. Documents found on a memory card of Maxwell’s included images of Larne police station marked manually with a blast radius graphic as well as a Mujahideen explosives handbook and the IRA’s Green Book - or rule book. Another local target was Ballylumford Power Station in Islandmagee. The card had maps, plans and lists of potential targets, as well as images of an adapted PSNI pass card and items of PSNI uniform, addresses of police officers, names of military staff, details of an MI5 member and of loyalists. Maxwell also bought chemicals and components and went on to manufacture explosives. His wi-fi password was “tiocfaidh1” - a derivation of the Irish republican phrase “tiocfaidh ar la”, or “our day will come”. Maxwell told police he had taken a man, whom he alleged was a member of the Continuity IRA, to a hide where he had stashed pipe bombs in Northern Ireland. The court was told the man he took to the hide was Niall Lehd, convicted in 2014 of possession of an explosive substance with intent to endanger life. Maxwell had handwritten “to-do lists” mentioning “targets, dummy runs and recces” and a number of towns in Northern Ireland. Targets also included an Orange Hall and a Territorial Army centre. There was also reference to a loyalist group, the need to notify news agencies, while under the heading “Easter leave tasks” were the words “test pipe bomb and car bomb”. In one of his hides, Maxwell placed a modified booby-trapped torch which, when armed, would explode if turned on. Maxwell lived in Exminster in Devon, and was based with 40 Commando in Taunton, Somerset. He never served in Northern Ireland. He was arrested last August and a search near Exeter found hides with a range of explosive substances, as well as ammunition, weapons and tools for making bombs. 13 military “igniter safety fuze electric” initiators; three fully-constructed improvised detonators; other component parts for IEDs (improvised explosive devices); other materials and chemicals to make explosives; a replica handgun and ammunition. Yesterday, prosecutor Richard Whittam QC told the court: “Across 14 of the locations involved in the investigation, Mr Maxwell had in his possession, or had constructed, 14 pipe bombs. Four have been deployed in Northern Ireland. The court heard dissident republicans have carried out more than 160 terrorist attacks since 2010, including the deployment of improvised explosive devices (IEDs) such as pipe bombs. The court heard that Maxwell “appeared shocked” when he was arrested. During interview, he told police he “got in over his head and didn’t know how to get away”. He was interviewed 22 times, remaining silent during the first seven. After his arrest, drugs were found in locker at the camp, including herbal cannabis, cannabis resin, and hallucinogenic drugs DMT and LSD. The Old Bailey was told that of the four pipe bombs constructed by Maxwell were used in Northern Ireland in the past year - in Belfast, Armagh and Carnlough. Only the device in Armagh detonated. Another pipe bomb made by Maxwell exploded in Larne in 2013. Two of the pipe bombs were used before Maxwell was arrested, and two after. In March 2016, police said bomb-making parts had been found in barrels hidden in a wooded area in Carnfunnock County Park outside Larne. Two months later, another “terrorist hide” was found in Capanagh Forest, in Kilwaughter. Police described it as one of the most significant arms finds in recent years. Of the pipe bombs found at Capanagh, Wednesday’s hearing was told: “The grooves in the pipe bombs would aid fragmentation increasing the potential for the devices to cause injury. Of particular concern to security chiefs was the discovery of military grade anti-personnel mines. Parts for making explosive devices also made up part of the haul. Their serial numbers revealed they had been taken from the Royal Marines base in Somerset where Maxwell was based.